When a high-profile gay celebrity couple asks two of the city’s most established vendors to provide cake and flowers for their wedding and they refuse, a resulting boycott threatens to shut them down. It’s up to the next generation in the family-owned businesses to save them from ruin. Justin Capella, baker’s son, and Roman Montgomery, floral scion, work together to plan the gay wedding of the year. Justin and Roman haven’t seen each other since that fateful day in third grade when a single kiss shocked Justin and sent Roman to boarding school. As fate would have it, Justin and Roman rediscover love while working on the wedding. But disaster might pry them apart again. Troopers Brandt and Donnelly are working with a statewide task force for the rights of LGBT citizens—all while searching for a killer wedding planner. As guests at the “wedding of the year”, they are the first responders when all hell breaks loose. In investigating, the troopers are led to a shadowy figure they believe seduced Roman into doing his bidding. But the real murderer will cover his tracks at all costs, including Roman and Justin’s lives. We start off with the planning of a wedding between two high-powered gay men in a town where gay marriage is still not completely accepted. Shopkeepers want to deny services to the couple so the law has to intervene and force compliance of equality laws – thus Brandt and Donnelly are called in. This is great as they are planning their own wedding (with the hilarious help of Bryce and Nestor of course!) so it’s convenient that they get to interview florists, bakers, etc in the name of justice. There is a bit more to the “mystery” in this story and some really shocking developments occur that will keep you on the edge of your seat and near your Kleenex box! 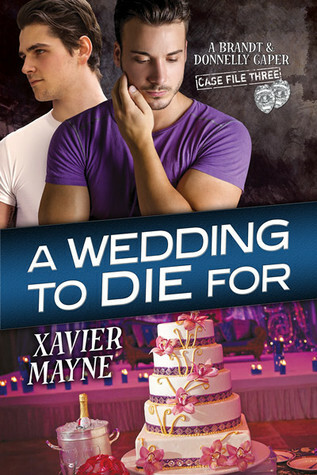 Xavier Mayne definitely had some “messages” to spread with this book, including the questionable “equality” gay couples have in our society despite more and more laws supporting gay marriage. If you have been reading this series you will find this book was a bit more “heavy” than the prior two and yet still just as funny, tender, sweet and entertaining, if not more so. I really love this series and the couples we meet each time and continue to follow and can’t wait for more. This entry was posted in Adult (18+), Contemporary, cop/crime, ebook, Established Couple, m/m, Part of a series, Suspense on January 12, 2015 by Morgan.